Great price. If they were boots I'd have a pair! ....in fact I'm very tempted anyway! Haven't seen anyone wearing these since about 1984. They look it.Haven't seen anyone wearing these since about 1984. Ugliest … They look it.Haven't seen anyone wearing these since about 1984. Ugliest shoes ever made? Maybe, but also the most comfortable. Take it you've never seen Uggs or original Crocs then? omg who wears these ugggggly shoes. Is fifty quid for DMs actually cheap ? I would seem to remember around £14.99 or so, back in the day. anyone have a link to the black ones? Dont Bother. DR martens shoes arnt what they use to be. They use Cheap material for the soul of the shoe. so it will wear out within a year. i brought some boots, and they have only lasted 8 months. Not worth the money i paid. will never buy another pair. For people of a certain age these are iconic shoes, unfortunately since they moved from Northampton lock stock and barrel to the far east quality has dipped dramatically, although I suppose if they hadn't have moved DM's would be no more. Dont Bother. DR martens shoes arnt what they use to be. They use Cheap … Dont Bother. DR martens shoes arnt what they use to be. They use Cheap material for the soul of the shoe. so it will wear out within a year. i brought some boots, and they have only lasted 8 months. Not worth the money i paid. will never buy another pair. The foriegn made ones, like in this deal, are rubbish now. You can still get Docs made in England to the high spec they always … You can still get Docs made in England to the high spec they always were...... but you have to pay a lot for emhttp://store.drmartens.co.uk/t-vintage.aspxThe foriegn made ones, like in this deal, are rubbish now. Really? I've seen loads! They're made a huge come back in the uk in the past couple of years - some celeb model has even made her own range for them - extremely over priced studded numbers with brothel creeper soles. I bought a pair of these 18 years ago for a lot of walking to and from job interviews. I have easily done 5k miles in the time i have had them and aside from a slight wearing on the heel from my gait, they look as good now polished up as when i first wore them. Easily the most comfortable shoe/boot i have had and for £50 at the time, a great investment. Not sure what these foreign made jobs are like though, so i would have to recommend British-made. Same thing with me, had my rigger boots for a few months now and it's already worn through the first layer of sole. No es bueno. 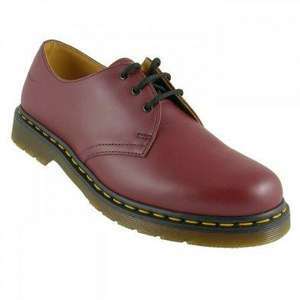 Original British made Dr Martens 1461 Mono for £57 reduced from £95. Just received my pair of these, and a pair of the moccasins. Just to clarify, these ARE the made in England variety, contrary to what the expert above has posted. Just out of curiosity, why would you assume these are not the made in england ones? This is a very good deal, so don't be put off by people guessing the quality!